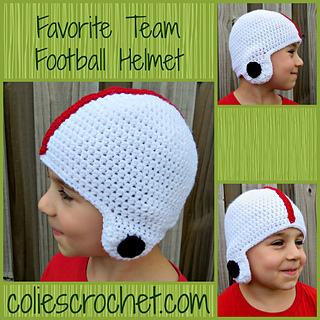 The Favorite Team Football Helmet was inspired by my almost 6-year-old son. He loves football just like his dad and will be playing football for the first time this fall. 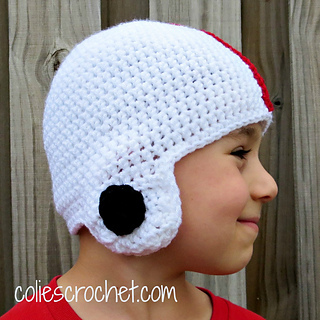 This completely customizable hat can be made in any colors to show your team spirit for any team. 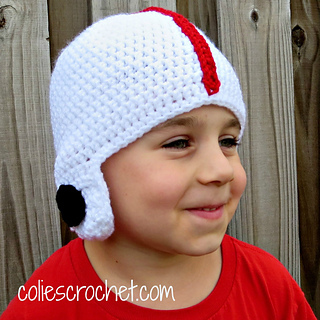 I also include ideas for adding letters, numbers and mascots to the sides of the helmets for the ultimate football fan. • I-5.5 mm hook; I use a Clover hook which I have found creates a slightly smaller stitch. I also tend to be a really tight crocheter. For these two reasons, I highly recommend working up a gauge swatch ahead of time. (See below in Pattern Notes for directions on working up a gauge swatch). • Worsted Weight yarn. I used I Love This Yarn by Hobby Lobby. You will need up to 100g or 175 yards of the main color and up to 11g or 20 yards of accent color. (This only includes yarn needed for the helmet, earholes and pinstripe, extra yarn will be needed if you choose to applique letters, numbers or mascots on the sides of the helmet). Aran yarn would be an acceptable substitute if you don’t have access to worsted weight yarn. • Crochet 1 hdc and 1 sc together – yo, insert hook into next st, yo, pull up a loop, insert hook into next st, yo, pull up a loop (4 loops on hook), yo, pull through all 4 loops on hook. • Always work a gauge swatch first. Each crocheter crochets with a different tension. I tend to crochet really tight. 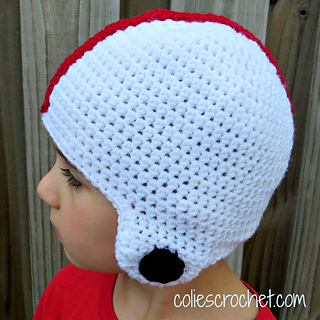 To complete a gauge swatch, I crochet a 5”x5” square in the stitch or pattern specified. This is so that at least the first and last row and the sides will not be included in my 4”x4” square. I then measure how many stitches and rows are in my square. If it is too small (you have more stitches or rows than specified), then you move up a hook size or two. If it is too big (you have fewer stitches or rows than specified), then you move down a hook size or two. The goal is to reach a gauge that is as close as possible to the pattern writer’s. It may seem like a waste of time, but I always find that it is worth it in the end; especially with fitted, wearable items. 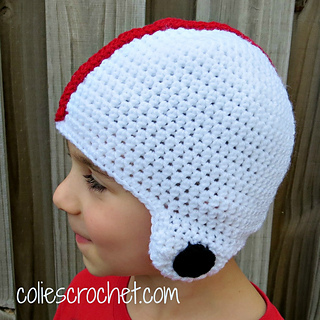 If you are not within ¼” when I give the diameter measurement for the crown of the hat in each pattern size, you should check your gauge and work a gauge swatch if you haven’t already.